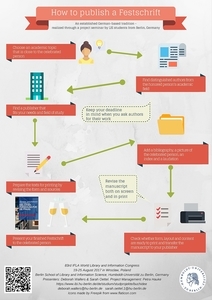 OETTEL, Sarah and WALLERS, Deborah and HAUKE, Petra (2017) How to publish a Festschrift. Paper presented at: IFLA WLIC 2017 – Wrocław, Poland – Libraries. Solidarity. Society. in Session 112 - Poster Sessions. 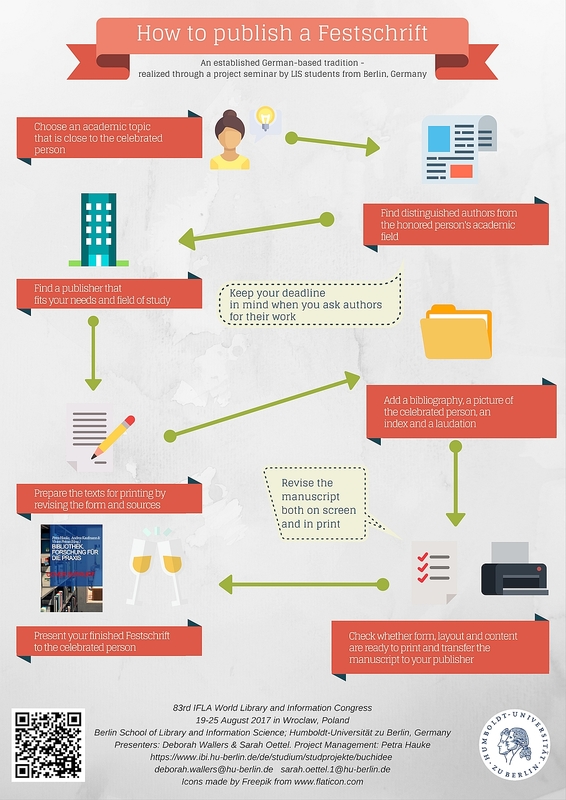 The poster “How to publish a Festschrift” overviews and explains the necessary steps that need to be realized to publish a festschrift. It contains detailed information about the process of finding distinguished authors from the celebrated person’s academic background, revising the texts and preparing them for printing and finding a suitable publisher. This poster and a festschrift were realized and published in line with a project seminar by LIS-students from Berlin, Germany. The seminar allows LIS-students to experience the conceptual design, execution and publication of an academic anthology.